3. Use your hands to bring the cookie dough together, but again don’t overmix. Shape into a rectangle of sorts, then lie on baking paper. Using the baking paper to help you, roll into a log / cylinder (mine was around 30cm long and 5-6cm wide). Place in the fridge to firm up overnight. 5. Once cool, melt your dark chocolate and coconut oil in a bain marie until melted and smooth. 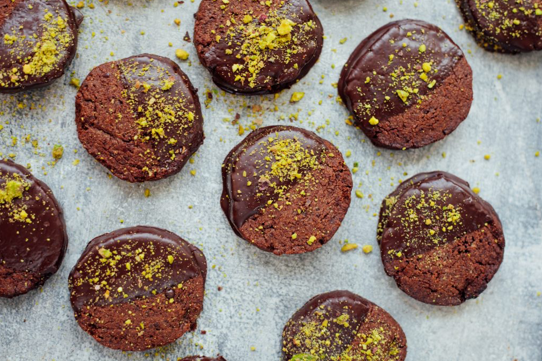 Dip each cooled cookie into the chocolate and sprinkle with pistachios, if using. Best eating the day of baking.